People are buying SUVs like the world is about to end. You’d think that an SUV-anything would sell well, right? Especially a Tesla SUV? Wrong. Model X deliveries have yet to keep pace with the Model S, as Musk predicted, and U.S. registrations of the SUV have slipped the last two quarters, according to IHS Markit. Tesla Dad Elon Musk thinks that the Model X’s complicated features, like its falcon-wing doors and its high price tag, are to blame for its tepid sales figures. For the upcoming Model 3, Musk says he will keep things simple. Because simple is better! We like simple. Yesterday, news broke of a class-action lawsuit that is accusing GM of installing defeat devices in over 700,000 trucks to cheat through U.S. emissions tests. Auto supplier Bosch was also named a defendant. But the fun doesn’t stop there. “There is an investigation into aiding and abetting fraud,” a spokesman for the Stuttgart prosecutor said following a media report published on Thursday. Just this past week, German law enforcement searched 11 Daimler offices for evidence to support the diesel cheating allegations. In addition to the GM and Daimler allegations, Bosch has also been cited in a lawsuit in the United States over FCA diesel emissions and was previously implicated in Volkswagen’s Dieselgate for allegedly helping develop the defeat devices. Cost is a huge factor for many when it comes to buying a car. And for electric cars to truly become more attractive than their gas-driven counterparts, one of the things that has to happen is that they need to be the cheaper option. Plus, when gas gets expensive, those EVs are going to look real good. As part of the Dieselgate settlement, VW will put $2 billion towards researching and promoting zero-emissions technology. VW’s plan, called Electrify America, would start off with increasing the number of car chargers across the nation. The remarks in a Wednesday letter from the California Air Resources Board to VW’s Electrify America come after criticism that the German automaker’s plan, part of a deal to atone for diesel emissions cheating, could give it a competitive advantage on other vehicle and charging station makers and ignore poorer communities where the state wants to promote clean cars. It asked VW to explain how it would meet a requirement to spend funds in disadvantaged communities, including installing electric vehicle charging stations. “CARB recommends that Electrify America make every attempt to attain investment of 35 percent of the first 30-month investment cycle in these communities,” said the letter, which was seen by Reuters. It also asked VW to describe potential plans for hydrogen vehicles over the 10-year investment period, since California’s zero-emission vehicle plan includes battery-electric and fuel-cell vehicles. Also, any money spent on education and outreach can’t be brand-y or feature VW cars. It’s like California is making VW bankroll these advancements in zero-emissions tech without any personal gain to its own company. “I just feel safer in an SUV,” I’ve heard people gush. I’d always thought this was some kind of justification for wanting a fashionable barn on wheels, but maybe there’s some merit to this statement after all. Models with the highest rates of driver deaths per million registered years, or vehicles registered for one year, for models that were made between 2012 and 2015 is the Hyundai Accent four-door sedan, which had 104 deaths per million registered vehicle years. The Accent was followed by the Kia Rio sedan at 102 deaths per million registered vehicle years; the Scion tC 2-door car, which had 101 deaths; the Chevrolet Spark 4-door car; and the Nissan Versa. The study found the top five models with the lowest driver death rates were the Volkswagen Tiguan 2WD SUV, Toyota Tacoma Double Cab long bed 4WD pickup, Mazda CX-9 2WD SUV, Audi A6 4WD and Audi Q7 4WD. All had zero driver deaths in the period measured. Of course, having a small car isn’t the only reason for higher fatalities. Part of the reason is that gas is cheap, so people are driving more. More cars on the roads just increases the probability of crashes. Still, though: best to be careful out there, everyone! 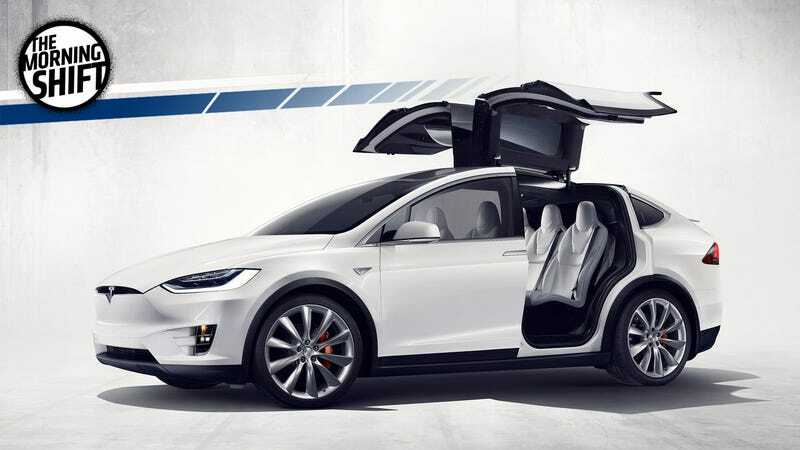 Neutral: Personally, I find the Model X’s falcon-doors to be silly and gimmicky. And it’s expensive as all hell. Why do you think it’s not selling well?